WHY first took shape in the late 90’s in Winnipeg Manitoba, Canada. They recorded their first album “THE NAKED SOUL”, and followed it with 2002's “THE RISE AND FALL OF THE QUESTION MARK”, which drew fans and critics alike to their energy-fueled live shows. WHY recorded "THE LAZARUS EFFECT" (a medical term for the turnaround that AIDS victims have when put on AIDS meds). Copies of the LAZARUS EFFECT album were given out before U2 concerts in Ottawa and Montreal and were made available at Make Poverty History and on-line at CDBABY.COM. A portion of the proceeds from the album went OXFAM. 2007 WHY released the album “RED” The single (and title track) "RED" sat a #1 on the KICK FM Winnipeg Top 40 for 4 weeks in a row, and was named "Song of the Year". Second single, "The Surface",hit charts, hitting #1 on KICK FM and #5 on THE Q FM in Victoria, BC. WHY have released "WE STARTED OUT(Somebody's Baby)"and "MORE OR LESS" as part of Ray Zahab's(RUNNING THE SAHARA) next film. 2010 the song "PRISONER of HOPE" is released supporting UNICEF's work in Haiti. 100% of WHY’s iTUNES profits go directly to UNICEF. WHY recently had 3 songs featured in the film “Of Games & Escapes” which is screening at film festivals across North America. WHY have been opening act for recording artists: DANKO JONES, ILL SCARLETT, EDGAR WINTER and recently UNCLE KRACKER. WHY were recently voted “Best Rock Band In Canada” by INTEL CANADA star search. Currently WHY are faring well on the REVERBNATION.com Charts #47 Globally , #2 Nationally and holding for over a year at #1 Locally. 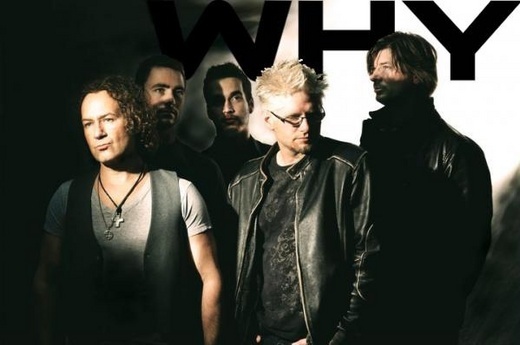 WHY recently released the singles: “DO IT SCARED”,”CRASH INTO THE FUTURE” “GIVE YOURSELF TO LOVE” and “WEEP”.